This 28 minute documentary-style safety video is the culmination of two years of filming. The content was collected by five individual boating sub chapters: The Pilot, The Paddlers, The Sailors, The Motor Boaters and Operation Clear Channel. Along with Liberty Yacht Club’s Vice Commodore, Jim Chambers, the video seeks to tell the first-hand story of how to operate safely and how to work together as one tribe of mariners in the Port of New York and New Jersey. The video originally appeared on thesafeboating.us website and was made using a grant from the State of NJ Dept of Transportation Maritime Division IBoatNJ Program. John Rako was the Executive Producer. DON’T FORGET THIS IMPORTANT DOCUMENT! So, you have finally fulfilled your dream of having a boat! Or, you have been crew on your friend’s boats for several years. If you own a boat you have the vessel registered with the U. S. Coast Guard, a port of call has been secured, and the boat has been insured. You have a ships log, i.e. trips, repairs, and more recorded in a notebook of some kind. You know what PHRF stands for, and have a copy of the U.S. Sailing Rules of Racing. But do you have a sailing/racing profile? 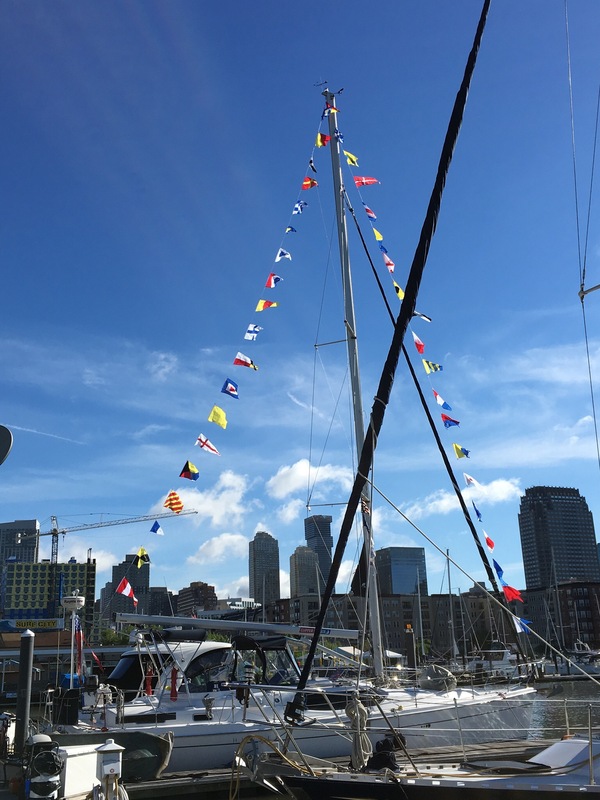 During holidays, at regattas or on other special occasions, dressing a ship in brightly colored flags has been a long and fun tradition. Not only does it look festive, but it also pays homage to centuries of maritime history. The flags which are used for dressing ships are known as the International Code of Signal Flags, often called alphabet flags because each flag represents a particular letter or number.